Skiing in Scotland is a fantastic way to enjoy the fun of winter sports without leaving the UK. Despite popular belief, Scottish ski resorts have a wide variety of different terrains, ski run difficulties and modern facilities to help you make the most of the snow. In this guide we outline the 5 Scottish ski resorts, how to access them and the best places to stay once you’re there. Glencoe is the oldest ski area in Scotland, with the UK’s first ski tow installed here in the 50s. At Glencoe, you’ll find some of the most difficult skiing in Scotland including the ‘Flypaper’, known as the steepest black run in Britain. This makes the resort a great place for more experienced skiers and those looking for a challenge in the UK. However, Glencoe also has a large plateau which is a perfect place for those new to skiing to hone their skills. For those who don’t want to ski, there is a free sledging slope with sledges provided. The nearest airport is Glasgow and the closest access by rail is from Bridge of Orchy station. If you’re looking for a place to stay, the Ballachulish Hotel is a 25 minute drive away and offers beautiful views across Loch Linhe. If you want a more traditional experience, stay in one of the Microlodges located at the resort itself. Although not quite as big as Glenshee, Cairngorm Mountain is the most developed of the Scottish ski resorts. There are 12 lifts and 30km of ski runs with 11 green, 11 blue, 10 red and 3 black runs to cater for a wide variety of abilities. Freestyle skiers and snowboarders can also hone their skills on ramps and rails in the dedicated snowpark. The resort is home to Scotland’s only funicular railway, which will take passengers from the base of the Mountain up to over 3500 feet. At the summit, skiers and non- skiers can enjoy the breathtaking views and a meal at Scotland’s highest restaurant. The closest airport is Inverness and the closest station is Aviemore. Many skiers and snowboarders will stay in Aviemore, where accommodation highlights include the Cairngorm Hotel in the town centre and the Woodland lodges at the Macdonald Aviemore Resort. Nevis Range is the highest resort in Scotland with some of the most modern facilities. There are approximately 20 km of ski runs catering to a large range of abilities and Scotland’s only Mountain Gondala, so non-skiers can also enjoy venturing to the top of the Mountain in comfort. February and March are the best months to go but the high location means skiing will often continue into late spring. Freestyle skiers and snowboarders can enjoy practicing their tricks at the Boardwise Terrain park. The resort is located a 15 minute drive from Fort William station and the nearest airports are Inverness and Glasgow. Fort William is one of the closest towns and here you can stay in the Lime Tree hotel, located in an 1850s building looking over Eil Loch. For a more budget friendly option, try the Fort William Travelodge. Glenshee is Scotland’s largest ski resort. Spread across 200 hectares, the ski area contains 22 lifts and 36 ski runs spread across 4 Mountains. This size offers a lot of variety in the terrain with 26 blue and red runs, 2 black runs and the 2km long Glas Moal run. There are also extensive nursery slopes at the bottom of the lifts, helping to make Glenshee a great destination for all abilities from experienced skiers to novice snowboarders. The closest station to Glenshee is Perth and the resort is accessible from Aberdeen airport. If you’re in need of budget accommodation, stay at the Braemar Youth Hostel. For something more luxurious try Dalmunzie Castle, a hotel sitting in an estate dating back to 1510. The Lecht Ski Centre sits 2090 feet above sea level with 20 ski runs. The resort has shorter runs than other Scottish ski resorts and with just 5 red and one black run, is definitely more suited to beginners and families. There are five green graded runs and if you’re worried about getting on and off ski lifts, the easy ‘Magic Carpet’ travelator allows you to simply step on to travel to the top. For those who don’t want to ski, there’s tubing and ‘devil karting’ to keep you entertained. The nearest airport and station is Aberdeen. Places to stay include the Argyle Guest House which is a ten minute drive away and the Kildrummy Castle Hotel, located just off the A97. With increased investment in modern facilities such as snow making, skiing in Scotland is increasing in popularity. 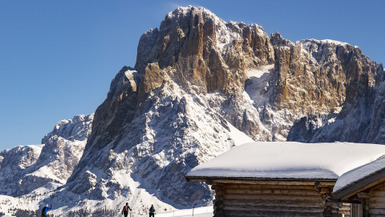 Although the resorts above can’t offer the same number of lifts and marked runs as the popular European resorts, they are still able to provide unique ski and snowboard experiences with new runs to explore and easy access from the UK. If you’re heading to a Scottish ski resort, check out the Mountain Warehouse Ski Wear range. 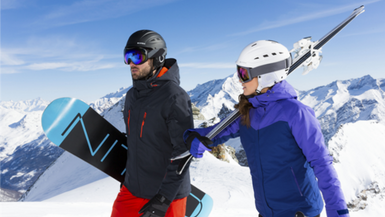 With ski jackets, trousers, gloves and outfit packages, you’ll find everything you need to enjoy your next ski holiday.